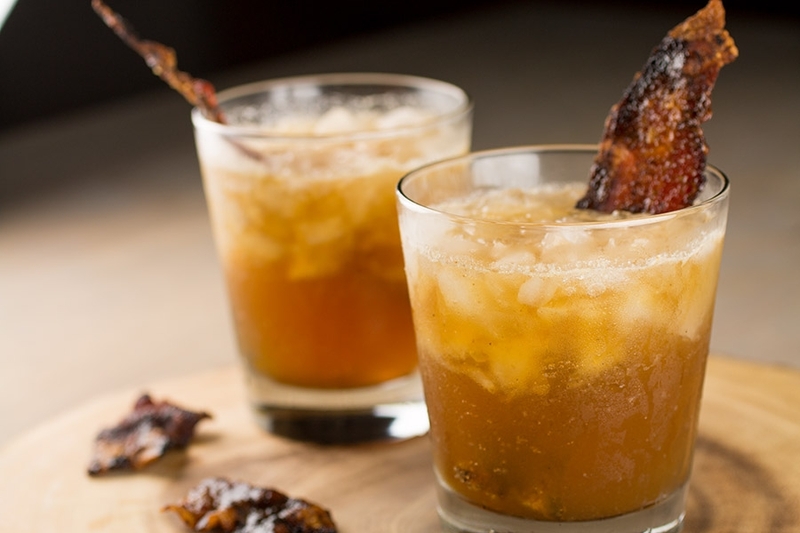 A refreshing and summery cocktail recipe made with ginger beer, whiskey, lemon juice and candied bacon. Patty here again with another “Thirsty Thirteenth“. Whoop whoop! Since Father’s day is approaching, I decided to make a drink dedicated to and inspired by my Dad. This year is extra special for him because his birthday is just a couple days before Father’s day and he is turning the big 7-0. My Dad switched over from a beer drinker to Jack Daniel’s many years ago. He was trying all sorts of crazy things because he didn’t like the Jack and Coke route at all. For a while he was drinking Jack and Gatorade. All different flavors of Gatorade. Everyone thought he was crazy. Some of them were really gross but others not too bad. One day someone told him that the upper and a downer combination might not be so good for him since he wasn’t exactly a spring chicken. So, he switched to Jack and water. The great thing about that is you can get it anywhere, it’s super easy and you aren’t adding any calories. My Dad is such a huge Jack Daniels fan that he even brought some for a vacation in Europe. He was worried if he wanted to make his own drink at a hotel he wouldn’t be able to find his favorite Tennessee whiskey at a local liquor store. I remember one year for our family Christmas party of about 50 people, my Dad wanted to do a whiskey tasting so he brought the various levels of Jack Daniel’s and one Jim Beam. The winner… drum roll… was the Single Barrel Jack. Now, there are certainly plenty of other whiskeys out there. Bourbon is a pretty serious thing amongst some of the guys we hang out with. Many different kinds get sampled at parties. They’ve been teaching me all about the differences between bourbon and whiskey so I know better than to call this a Bourbon drink. Too bad since tomorrow is National Bourbon day. Boo. For those who don’t gravitate toward brown liquor, like myself, a summery whiskey cocktail like this one might change your mind. It just might. Try it on the rocks or neat to really get the full essence of the liquor. Just make sure you’ve chilled it first. I actually was able to have a couple of those bourbon loving guys mentioned above sample my drink. It was fun for me to discuss the levels of flavor and possible variations. Can’t wait to keep sampling all summer long. My Dad recently has been chilling his bottle of Jack Daniel’s because the ice waters it down too much and he likes it cold. And it’s hot out. Summer is here. With my many mixology attempts, I am finding a Moscow mule is a great go-to with just about any type of alcohol. Hopefully over time I’ll get to try them all. For the ginger beer I was lucky enough to find some from a local Milwaukee brewery that I love, Lakefront New Grist. I greatly love the hard ginger beers to imparat a drink with real beer flavor instead of a soda flavor. This is going with whiskey after all. I told my Dad about the drink I was making for Thirsty Thirteenth, dedicated to him. He said, and I quote… “That drink looks serious! I would like to try it.“ So I will be making it for him on Father’s Day. I hope you give this cocktail a try and get to taste it with your Dad this Father’s day. Place the bacon on a lined baking sheet. Cover with the brown sugar and chili powder. You can be generous with the chili powder if you like it hot. The sugar overpowers and dilutes the spice quite a bit. Bake at 375 degrees for 15 minutes or until crispy. Let cool completely, at least an hour to overnight. 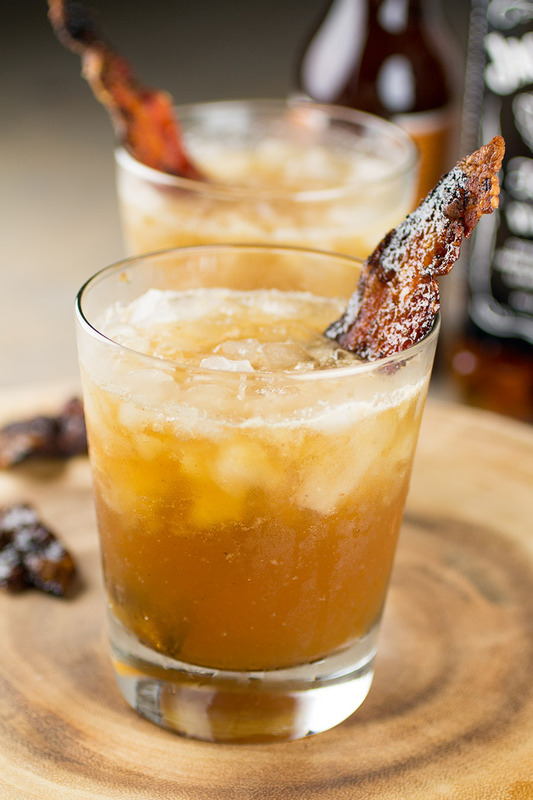 Place 4 slices bacon in a cocktail shaker with the Jack Daniel’s. Shake vigorously. 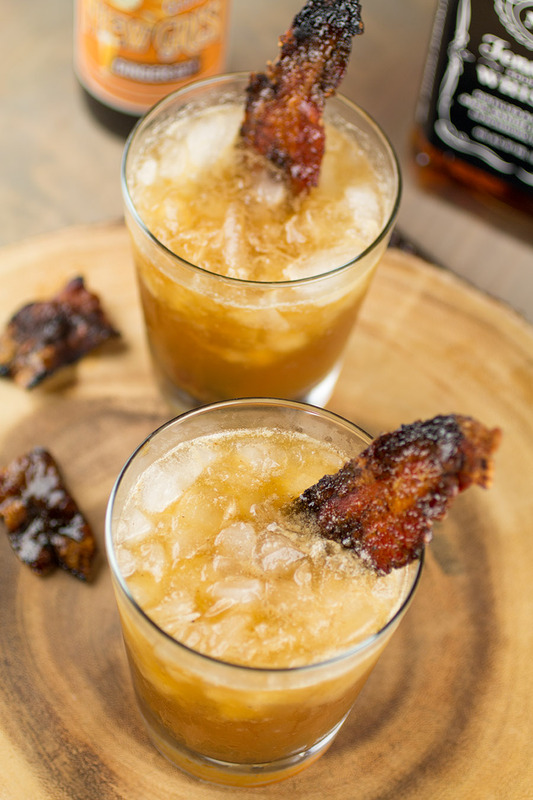 Let the candied bacon and whiskey steep for at least 10 minutes. You can go as long as overnight to really meld the flavors. It depends on how much of that bacon and smoky flavor you really want to infuse. The longer it steeps the more straining you will need. Fill 2 glasses with crushed ice. Add strained bacon whiskey and lemon juice. Stir. Add ginger beer and stir lightly. Serve with a slice of candied bacon garnish. I have the bacon in the oven right now… Gonna make some tonight. Cant wait. Thanks for the recipe!